Heather P. Johnson is a freelance writer, as well as a contributor for Credit Card Lowdown, a site for finding credit card reviews. Heather invites your comments and freelancing job opportunities at her email address: heatherjohnson2323@gmail.com. Many of us have to maintain a lean lifestyle when we are in college. While you could argue that this is an effective way to build character, that perspective doesn’t make life any easier when you’re sitting down for another bowl of Ramen noodles. If you are a college student who is having trouble making ends meet, try the following 12 simple tips for saving money. Create a household budget. Most importantly, you need to make sure you stick to the budget. American Consumer Credit Counseling (ACCC) offers a free household budget worksheet. Avoid buying new textbooks. If you can’t find what you need at a local used bookstore, try eBay or socialbib. The latter is a free online book swap for college students. Sell your books wisely. If the college bookstore is offering very little, see if your textbooks are going for more on eBay or Amazon. Don’t splurge on fashionable clothes. You will have the rest of your life to be chic. For now, all you need is something comfortable to get you through those boring lectures (and maybe one suit for interviews). Use college discounts. Many restaurants and shops around town probably offer college discounts without your knowledge. Never be afraid to ask. Clip coupons. Effective “couponing” can save a bundle, though it will be a bit time consuming on the weekends. There are many coupon clippers who consistently save hundreds of dollars on groceries each month. Learn how to get started here. Eat at home. While you can’t always eat at home when you’re on the go, you should really reduce those trips to the drive-thru. They will eat through your wallet and wreak havoc on your waistline. Consider a roommate. If you are currently living alone and having trouble paying rent, it could be time for a roommate. There will be plenty of interested (and interesting) people around campus who can split the rent with you. Avoid partying on the weekends. College doesn’t have to be synonymous with partying. Not only will it make Monday morning classes harder and harder to attend, drinking can be very expensive. Find a more practical way to relax when you aren’t in class or studying. Ride a bike. Do you live close to campus? If so, then you may be needlessly spending money on gas. Ride a bicycle whenever it’s feasible and you will help save money, as well as the environment. Skip paid television. Assuming you are already paying for an Internet connection, you don’t need paid television. Many networks rerun their programs online now (try Hulu.com. Besides, you have more important things to do than sit in front of the television, like studying or finding post-college employment! Although it doesn’t sound very fun to you now, being frugal in college can have positive effects on your future. Every year, more young adults are graduating college with substantial debt. While student loans are sometimes necessary, you shouldn’t have a significant amount of debt when starting out with your career. Some careful planning today will help you for many years to come. Wish I had this list ten years ago! Excellent job! The Ramen noodles really brought back the memories. I could almost smell the Ramen chicken noodle steam coming from my little microwave like it was just yesterday. 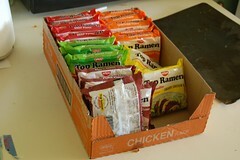 You know I haven’t had a pack of Ramen noodles since graduation…Talk about burn out! All very sound advice. I’m fairly proud to say that I followed almost all of them while in college. Selling textbooks back to the bookstore is the biggest rip off on the planet. Avoid at all costs. Roommates are also key. We had a $900/month 3bed/2bath duplex in college that with 3 guys splitting it, cost at most $400/month with utilities included. It was great. @Lau, yeah, I don’t think I could have gotten through college without some partying. However, during my first 3 years (prior to turning 21) I had more fun when I was sober than when I was drinking so we just didn’t drink much (oh, and getting alcohol was hard anyway). It just wasn’t as much fun after turning 21 and going to the bars. So honestly you can still have a great time sober and save yourself some cash. Sometimes it’s more fun watching the drunk people anyway. Oh wow… Ramen noodles. That sure takes me back (all of four years)! I had a Ramen noodle cookbook when I was in college, and it almost made those 10 cent packages tasty. Thats what I did, I just bought used books. Its all the same! I always tried to buy used books or borrow them from other people in classes. When I got into my last 2 years I really started to look at books I needed, and didn’t buy the ones only used for reference. I wasn’t one for the Ramen noodles, but rather Easy Mac. Not that I want to do college over again, I think I did pretty well while I was getting through it. While at college I followed some of the rules mentioned in the post. I always preferred bought used books, sold off the books that i didnt need and always carried my food from home. If you’re an eco-friendly student, you can save money and the environment at the same time by reusing and recycling things. You can use old coffee grinds as plant fertilizer, scratched CDs as drink coasters or bike reflectors and plastic soda bottles as planters. As for textbooks, you can trade them for free on a website like Swaptree.com or FreeCycle.org, or sell them on CraigsList.org or Half.com. The more you trade and reuse books, the less money you’ll spend and the more trees you’ll prevent from being cut down!